Businesses in Sammamish will have their annual opportunity to recycle everything from cardboard to computers next week. The city will sponsor a business recycling collection event from 11 a.m. to 4 p.m. August 13 at Eastlake High School, 400 228th Avenue Northeast. Paul Devine, an organizer for the event, said the collection is designed for businesses to get rid of items that accumulate in small quantities, like wood pallets and fluorescent light bulbs. 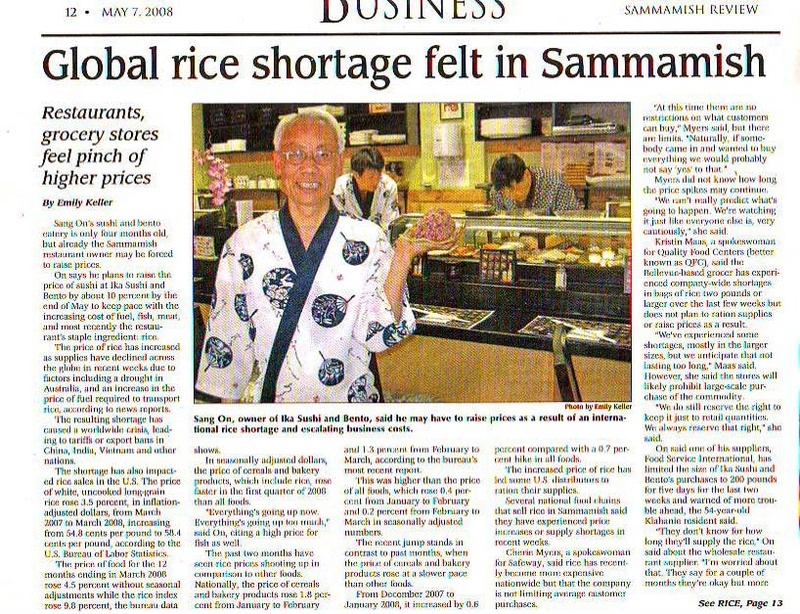 "Global Rice Shortage Felt in Sammamish" is about the impact that higher rice costs in the summer of 2008 had on local restaurants. Published in the Sammamish Review. Click here to read page one, and here for page two.